Synovial cyst is a benign tumor that usually presents as a small rounded nodule above the joints or tendons, especially in the hands and wrists. 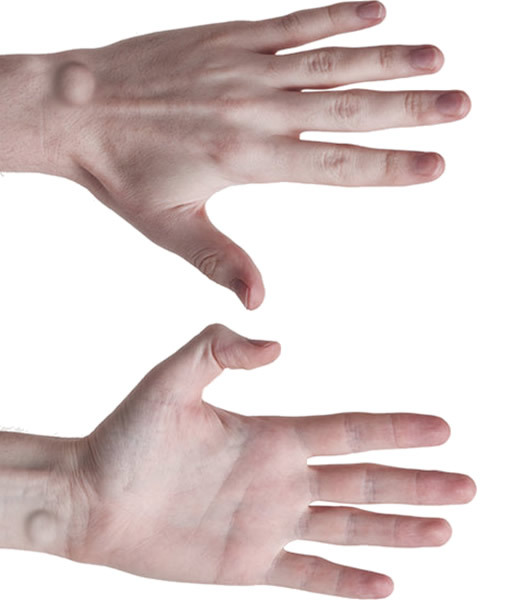 In English, the synovial cyst is a ball of soft consistency, usually arising above the wrist or in one of the fingers. To understand what synovial cyst is, we need to talk a little bit about synovium and joints. Everyone understands that our skeleton is widely articulated. We were able to bend and turn arms, legs, hands, fingers, neck, etc. All this range of movements that our skeleton is able to do is due to the fact that we have joints, which are the structures that join two different bones and allow movement between them. As an example of joints, we can mention the knees, elbows, ankles and wrists. In order for this movement of one bone against the other does not cause friction and wear, within the joints there are two important structures, the synovial fluid and the cartilages. Cartilage is a slippery tissue located at the ends of the articulated bones. Synovial fluid is a kind of lubricant that sits inside the joints, surrounded by a pouch called synovium. These two structures allow the bones of the joints to slide one over the other for years and years with minimal friction, preventing wear. The loss of these two structures causes bone damage, leading to a disease called arthrosis. In addition to the joints, the tendons are also surrounded by a pouch containing synovial fluid. Cyst is a name we give to any bag that has liquid or semi-liquid material inside it. The synovial cyst is, therefore, is a pouch containing synovial fluid. The synovial cyst arises in the joints or tendons, being a herniation of part of the synovium and the capsule of the joints. This "leak" of synovial fluid out of the joints forms a pouch that can be easily seen and palpated. Although it originates in the synovial fluid, the synovial cyst content is not purely liquid. The material inside the cyst is isolated from the rest of the joint and ends up forming a kind of jelly. It is not known very well why synovial cysts arise. The most accepted theory is that small lesions of the joint capsule, caused by traumas or repetitive stress, allow extravasation of synovial fluid out of the joint, forming the cyst. In addition to trauma and excessive joint use, a defect in joint formation also appears to be important, since synovial cyst may occur in people with no history of trauma or repetitive use of the joint. Synovial cyst is a rounded mass, which usually has a diameter of 1 to 3 centimeters, compressible and of a rubbery consistency. The cyst is usually visible and palpable, the skin being completely intact and without inflammatory signs. The lesion is translucent, turning reddish when we throw a spotlight on it, demonstrating its fluid content. The cyst may appear suddenly or grow over time. Their size can vary, being more or less bulky at certain times. It may also disappear spontaneously and reappear later. Synovial cyst may occur in any joint, but its most common location is in the wrist region or in one of the fingers of the hand. It does not usually cause pain, but it can do so if the mass compresses some nerve. In this situation, besides pain, it is also possible to have loss of strength and tenderness in the region of the joint or tendon. There are cases of small, hidden synovial cysts, which are not visible through the skin but are discovered to have caused pain. Hidden cysts can be diagnosed by ultrasound or magnetic resonance imaging. The synovial cyst is a benign tumor, with no possibility of turning into cancer. In most cases it is asymptomatic and, as it may disappear spontaneously, no treatment is necessary. On the other hand, if the cyst is causing pain or disturbing the movement of the joint, medical treatment is indicated. A simple treatment is the immobilization of the joint with splints, in order to compress the cyst and prevent movement of the joint. In this way, an attempt is made to create an opposing mechanism by pushing the cyst material back into the joint. The aspiration of the cyst with a needle is another option and can be done with local anesthetics in the office itself. After aspiration, the doctor usually infuses a solution with corticosteroids to stick the walls of the cyst and disrupt its refill. The success rate of this technique is 75%. The aspiration presents results superior to the immobilization by splint, but, nevertheless, there is a risk of recurrence of the cyst. In about 15 to 20% of cases, the cyst returns frequently and if the patient continues to have complaints of pain or discomfort, the orthopaedist may indicate the surgical removal of the cyst. Surgery can be done via the classical route or through arthroscopy. The problem with surgery is that it is a much more invasive procedure and does not guarantee 100% cure. Even after surgical removal, the synovial cyst may return. Taking Contraceptives Cause Weight Gain?